The chanting of Om Namo Bhagavate Muktanandaya in the Bhupali raga was resounding throughout Atma Nidhi as Gurumayi stepped into the Annapurna Dining Hall. Participants had gathered there to welcome Gurumayi for the birthday cake-cutting ceremony. Since Gurudev Siddha Peeth, the first Siddha Yoga Ashram, was established in India in 1956, the area where food is prepared and served in the Ashrams has been called Annapurna. Gurumayi’s Guru, Baba Muktananda, gave it this name to honor Annapurna Devi—the presiding deity of food, the goddess of nourishment. Time and again over the years, Gurumayi and Baba have imparted the teaching “Food is God.” And many of us have taken great inspiration from Gurumayi’s talk of the same name, “Food Is God,” which she gave for her birthday in 2016. On the Siddha Yoga path we honor Annapurna Devi by singing a beautiful hymn called the Annapurna Stotram. Among the people who welcomed Gurumayi in Annapurna Dining Hall were many young children with their families. There was also a six-month-old puppy, Adideva, whose caretakers are Shubha de Oliveira-Thompson, one of the Managers for Shree Muktananda Ashram, and Ryan Thompson, who is head of the Garden Department. Once Gurumayi had taken her seat, Elizabeth Greig, the master of ceremonies and a Trustee of the SYDA Foundation, welcomed Gurumayi and invited everyone to join her in wishing Gurumayi a happy birthday. We had all been waiting for this moment—when we could collectively offer Gurumayi our love and wish her the best birthday ever! Then Krishna Haddad, the Music Director for the Birthday Celebration, led the music ensemble—and all of us—in reciting Shri Guru Paduka Panchakam, “Five Stanzas on the Sandals of Shri Guru.” On the Siddha Yoga path, these stanzas are recited each morning as part of the recitation of Shri Guru Gita, in salutation to Shri Guru’s feet. The scriptures extol Shri Guru’s lotus feet as the embodiment of knowledge and shakti. The power of Shri Guru’s padukas is exemplified in the story of Nizamuddin and Amir Khusro, which we often tell and read at the time of Gurupurnima. Our hearts were positively brimming with devotion after honoring Gurumayi in this way. At Krishna’s direction we began singing the bhajan Naco Re Mero Mana. Gurumayi composed the music for this bhajan, which was written by the poet-saint Kabir, for the Siddha Yoga Winter Retreat in 1997-1998 in Santa Clara, California. For the last many years, it has been sung for every celebration of Gurumayi’s birthday around the world. the planets and stars are dancing with ecstasy. Each new birth of a soul is a matter of great joy. All humanity celebrates this bliss with laughter and tears. While we sang, one six-month-old baby, who was sitting up and gazing at Gurumayi, seemed to be relishing every moment. His hands and arms waved, his body swayed, and his smile was radiant. Gurumayi opened her eyes wide at him, causing him to giggle merrily. At one point he rested his hand over his heart, and Gurumayi responded by placing her hand on her heart. Their communication was beautiful to watch and moved my heart deeply. The “upsurge of divine love” was palpable in the hall. We were all experiencing it as Elizabeth warmly invited Gurumayi to cut the birthday cake. Once there was a rabbi. Yes, telling a rabbi story in the Catskills is the right thing to do. This rabbi was eighty years old. And one day, someone asked him a question. There’s a story behind this moment, which was deeply significant for Prema. Six years ago, in 2012, when Prema was four years old, she had participated in Gurumayi’s Birthday Celebration in Shree Muktananda Ashram. Many children were gathered around as Gurumayi went to cut her birthday cake. After blowing out the candles, Gurumayi began sharing the first bites of cake with the children. At one point, Gurumayi held out a small piece of cake to a young boy who shook his head from side to side, indicating no—he did not want to taste the cake. Gurumayi then turned to the next child, who happened to be Prema, to give her some cake. Prema imitated the boy and shook her head. She didn’t take the cake that Gurumayi was giving to her. The other children, meanwhile, excitedly accepted pieces of cake from Gurumayi, and they all relished the taste. This interaction from 2012 is recorded in the Birthday Bliss Pilgrimage video on the Siddha Yoga path website. Prema and her family and friends watched that video many times over the years. Whenever they watched, someone would comment on how Prema didn’t accept the cake from Gurumayi. Prema has often thought about that moment, about not taking the sweet prasad from her Guru that day. Prema’s parents thought that Prema’s natural inclination had been to accept the cake that Gurumayi was giving her. Yet, instead of following her heart, she looked at what the little boy before her did and followed suit, as she thought that must be the “appropriate thing“ to do. This year, in 2018, not only did Prema help Gurumayi cut the birthday cake, but when Gurumayi went to give her a piece, she was open and receptive to Gurumayi’s invitation to taste it. She listened to her own heart and readily accepted the prasad. Anyone who has watched the Birthday Bliss Pilgrimage video and then witnessed this moment—or is reading this account—would have the revelation that Prema has changed her narrative. She has reshaped her destiny. Hearing Gurumayi say that she was going to check if lunch was being prepared tickled our funny bones to the max! We’ve come to cherish Gurumayi’s teasing, her humor and her playfulness. Knowing that there would be more to this celebration—we would be meeting Gurumayi again soon!—made our hearts leap with joy. We didn’t have to walk; we practically floated to Shri Nilaya to prepare to welcome Gurumayi once again. I’m continually awed by how a single interaction Gurumayi has with one person can ripple out and have a transformative effect on seekers around the world. Contemplating Prema’s story, I realized that all of the opportunities to expand that I’ve been given on the Siddha Yoga path have profoundly reshaped the course of my life in a positive way. I also realized that, even at this very moment, I can take action to more fully embrace and share the gifts I’ve been given. I’m so grateful for Gurumayi, whose every action is so permeated with grace that simply hearing about one can shift the course of a person’s life. I was inspired to read that Prema, having reflected on her past response and now in a new stage of life, has created a new story for herself. What stood out for me are the ways in which Gurumayi gives us new chances and offers her grace to us again and again. This brings back a similar experience I once had while interacting with Gurumayi. I had reflexively behaved in an imitative way and it was clear that I was not on the right track. I contemplated that experience a lot. And amazingly, several months later, I had an unexpected opportunity to interact with Gurumayi again. This time I kept my heart open, connected with Gurumayi, and was able to be of service in the situation at hand. I was so grateful for the opportunity to be in this situation and, due to my contemplation and Gurumayi's abundant grace, to have a vastly different experience. Thank you, Gurumayi, for empowering us to create new, uplifting narratives for our lives. Thank you for this account, filled with love, joy, and insight. 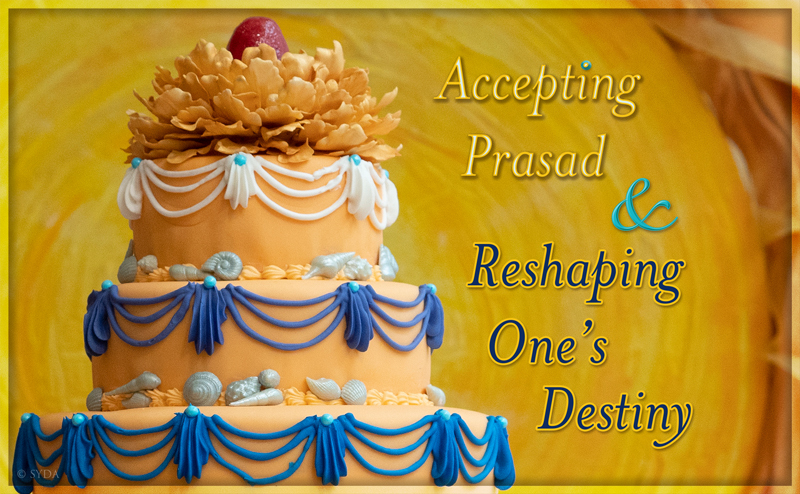 I take to heart the comment that the young girl Prema, by changing her narrative and this time accepting the cake—the prasad—has reshaped her destiny. Even in the space of a single day since reading this, I have been mindful of a few inner narratives of my own and how they shape how I see myself, and whether they make me open up to grace, joy, and a feeling of empowerment … or not. I gained a greater understanding of the value of the affirmation statement for the daily virtues during the month of Birthday Bliss—Sadguna Vaibhava. They are a gift for letting go of old, unnecessary narratives! This unfolding Birthday Bliss account so clearly shows how every interaction with a Siddha Guru is alive with grace, teachings, and the opportunity to learn and be transformed. Thank you for your never-ending grace and generosity, Shri Gurumayi. Prema's life-changing moment brings to mind the many small moments I experience that appear inconsequential but that I intuitively know to be quite consequential. Walking in a nearby village on a brief holiday, for example, I noticed a cottage for sale. "Wow, I could live there," I said to myself. Although that property turned out to be unsuitable, I felt that I had been given a strong message that it was time for change and a new challenge—a new direction that would not only radically change my outer life, but my inner life too. My faith in my Guru and my own intuition has continued to support my adventure. My sense of my life purpose, of being in the right place at the right time with the right people, has been heightened. While reading “Accepting Prasad and Reshaping One’s Destiny,” I paused several times to imbibe the flavor of the various moments with Gurumayi. The sharing about the change in Prema's narrative took me particularly deep inside myself. Her story reminded me of a thought of a significant change I could make in my life that had flashed into my mind recently as I slipped into slumber. I recognized that nighttime thought as a gift of grace. And now I’m astounded to realize that by making an effort to put this change into action, I would reshape my own destiny. I'm awed and ever grateful for Gurumayi's generosity.